"This is such a simple recipe, and it is so delicious! 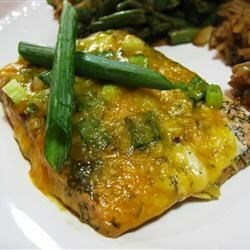 Salmon is baked with garlic and dill, and topped with Cheddar cheese and green onions." Place the salmon on a large piece of foil, and season with garlic, dill, salt, and pepper. Seal foil around the salmon. Place on a baking sheet. Bake 20 minutes in the preheated oven. Top with Cheddar cheese and green onions, and continue baking 5 minutes, or until cheese is melted and fish is easily flaked with a fork. I made this just like the recipe. The cheese and salmon seemed to cancel each other out. It didn't taste bad, just kind of bland. I also baked it on top of asparagus. I sprinkled mine with some dry parmesan spread mix and a couple pats of butter. I then eliminated the cheese on top. Superb! Made this with rice...YUMMY! Never thought to add cheddar to salmon.